Blog from Alice Springs, Australian Capital Territory | Gemma goes global! So the journey continues, this time west, very west! So basically take a left off the coast and away you go, for a long while. thsi will be the challenging part of the road trip, the drive in the australian red centre. As soon as you are a good few hundred km's from the coast, the towns and people get fewer and fewer, and further apart. Intially the first few days were about distance, trying to cover about 500 km's a day, stopping where we could to have lunch in the scorching heat, and any places of interest, or to take photos of strange goings on! The journeys soon became familiar, straight roads, sometimes over 100km's without a bend or single car passing. Red dust and dirt everywhere, such a vivid colour as well, and lots of dead kangeroo's on the side of the roads. And the further we got in, they just turned into skeletons, very outback. One of our first overnight towns was called Julia Creek. Only about 300 people strong. absolutely shattered from the long hot day we strolled into the 'local' for a cold beer. wondering whether we were even going to get served after the strange looks we got, we tried to 'blend' in. Eventually some locals made the brave move to talk to us, and we all played pool and swapped stories and drunk many scooners on beer, before retiring to some sofas in the garden. Back on the road again our next nights sleep was to be had in the even smaller town on Camooweal, where i think the local store was a good couple of hundred years old, along with the shop keeper. He also informed us of all the local history and that of the various world wars him and his father faught in. Eventually we left with our bread and eggs. The next couple of days took us to a place called The Devils Marbles, some very random balls of red rock in the middle of the outback. That night was enjoyed lying on the roof of Jim and and taking in the shooting and millions of other stars you can see out in the middle of no-where. Very excited at the arrival of Alice Springs, and seeing civilisation again, we spent a day or two here chilling out before heading the further 300km's to the world famous Ayres Rock. Managed to get there (along with all the other tourists) for the sunset, and also a very early start the next day for sunrise. Was spectacular to see it so close, and just to understand in person the impact of this amazing rock. After Alice Springs we were now changing directon and heading south back towards the much needed view of the coast line. The majority of the?surrounding area is?desert, and very sparse and not a drop of water in sight anywhere. I have never seen so many dried rivers and creeks in my life, so very strange. One of the most unique places we went to, if not the dustiest place was Coober Pedy in the centre of the desert. Its gets so hot out here the the majority of the people live in caves under the ground to escape the heat and on-slaught of flies you get here. So do as the locals do, and stay under ground in a cave. And i can see why they do it, was so cool and relaxing down there! So our first view of water again was Port Augusta, which beagn to lead us along the Great Ocean Road through to Adelaide. Really charming city where the people are so friendly (especially when they have to jump start Jim)?and so pleased that you are travelling their country. 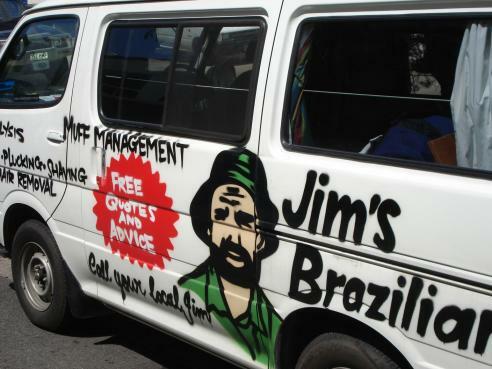 And to say that we drew even more attention to ourselves by driving round in Big Jim would be one of the biggest understatements i could make. It has been not stop commenting from people, taking pictures of him, and asking for quotes! It has brought so much fun to out trip and amusement at peoples reactions! The Great Ocean Road was stunning as well, and a really nice drive to finish off the road trip. Stopping at so many places along the Limestone Coast, such as the 12 Apostles, and gorgeous little coastal towns.